The major players working in the global stroke diagnostics and therapeutics market comprise Medtronic plc, Abbott Laboratories, Cordis Corporation, Boston Scientific Corporation, GE Healthcare, Koninklijke Philips N.V., Stryker Corporation, Siemens AG, Merck & Co., Inc., and Genentech, Inc. These players are claimed to maintain the development of stroke diagnostics and therapeutics market in the years to come. 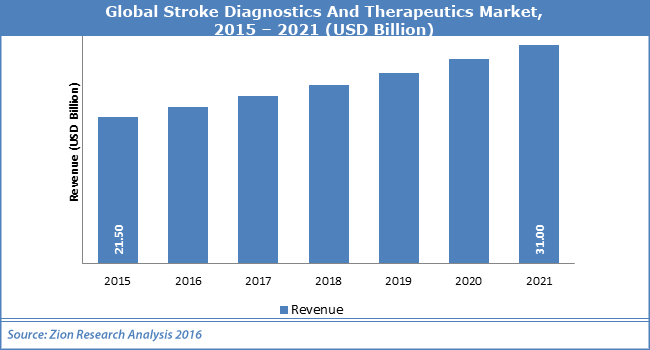 According to the analysts at Zion Market Research, the global stroke diagnostics and therapeutics market added up for USD 21.50 Billion in 2015 and is likely to cross USD 31.00 by 2021, developing at a CAGR of almost 7.0% from 2015 to 2021. Stroke diagnostics and therapeutics market have been paced by the huge patient pool in addition to the increasing aging population all over the world, as per analysts at Zion Market Research. In addition to this, rising number of the aged population in western nations particularly in Europe is the major boosting factor for powering the development of stroke diagnostics and therapeutics market. In addition to this, atrial fibrillation, hypertension, and coronary heart diseases are the helping hands that promote the development of stroke diagnostics and therapeutics market. On the other hand, the high price of treatment directly impacts the development of stroke diagnostics and therapeutics market. Moreover, shortage of transparent reimbursement practices is also expected to affect the development of stroke diagnostics and therapeutics market. Nevertheless, in-progress R&D in the healthcare industry techs is likely to open growth opportunities for the stroke diagnostics and therapeutics market in the years to come. For instance, in July 2018, it advancements in the therapeutic and diagnostic employment of carbon nanomaterials and liposomes in ischemic stroke were made. On the basis of application, the global stroke diagnostics and therapeutics market is divided into 2 types namely ischemic stroke and hemorrhagic stroke. In 2015, Ischemic stroke ruled the application division of global stroke diagnostics and therapeutics market. This division is likely to stay on the hike in the years to come. The development of stroke diagnostics and therapeutics market is credited due to huge occurrence of ischemic stroke in aged patient. In terms of regions, North America in 2015 was the leading area for stroke diagnostics and therapeutics market in terms of income chased by Europe. This was due to the accessibility of advanced tech and infrastructure. In addition to this, stroke diagnostics and therapeutics market have huge growth avenues in emerging regions such as Latin America and Asia Pacific owing to the public awareness, huge patient base, government initiatives, increase disposable income, and healthcare infrastructure.